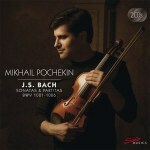 It is daring for a young violinist (Mikhail Pochekin was about 27 when these discs were recorded) to make his solo recording debut with the complete set of Bach’s demanding Sonatas and Partitas. (Pochekin had previously released a CD of duets with his brother Ivan, who plays violin and viola.) Unfortunately, although understandably, the results come off as more than a little half-baked. The program does get off to a good start with a nicely atmospheric first-movement “Adagio” of the G minor Sonata. Pochekin is clearly a skilled player, so that even when he reduces vibrato to a minimum (as he does frequently although not consistently), the tone generally remains warm and full. He does not try to evade the interpretive challenges of the music. Yet in a somewhat disappointing “Fuga”, his approach begins to seem too mannered, the phrasing not infrequently self-conscious, lacking in natural flow and inhibiting momentum. The normally lovely third-movement, “Siciliana” is, likewise, marred by some choppy phrasing. Such problems mark the whole cycle, albeit in varying degrees. Pochekin’s mannerisms seem to me to be least intrusive in the B minor Partitas and the A minor Sonata (as it happens), probably the least familiar of these works. Sadly, the nadir is the great C major Sonata which is given a fussy and episodic reading (particularly in the magnificent and lengthy “Fuga” and in the “Finale”) that never really gets off the ground. Other key movements are shortchanged as well: the “Chaconne” of the D minor Partita begins insensitively and (on the whole) does not sing out quite as much as it could, and the “Preludio” of the E major Partita initially gives the feeling of someone trying to drive fast but repeatedly encountering speed bumps. Yet there are plenty of moments in which Pochekin manages to project a more natural musicality; the contrasts even within a single movement can be striking. My overall impression is that Mikhail Pochekin has tried to deploy a range of stylistic and expressive gestures without integrating them into a coherent interpretative whole. At times there is apparently an attempt to play in a period style (not only in the intermittent absence of vibrato but also in the approach to phrasing and dynamics) yet without the gracefulness of the best gut-string players. Too often the expression seems to be imposed from the outside rather than emerging from the music itself. In short, while there are undoubtedly some good things here, this release is not competitive in a very crowded market.